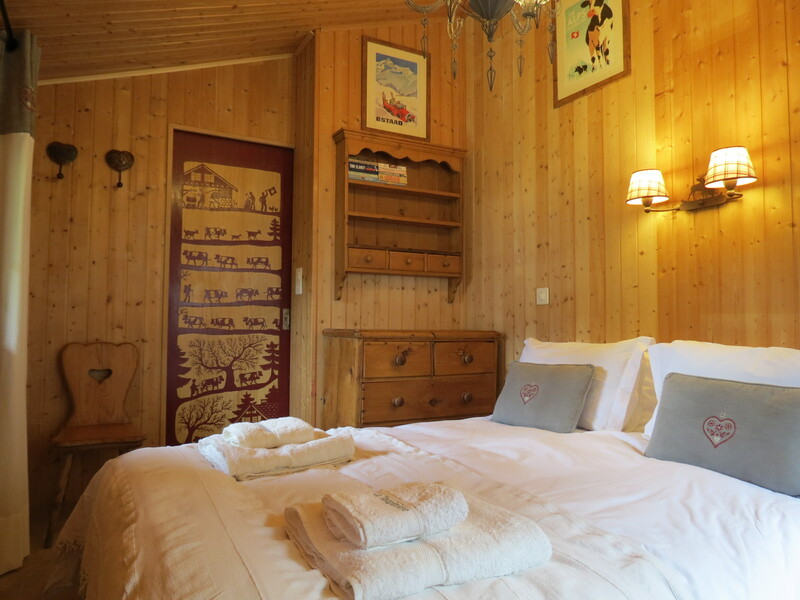 There are five bedrooms in Chalet La Taupiniere, four in the main chalet (three bedrooms on the lower ground floor and one single room on the upper, main living area floor) and one en-suite room in the attached studio/ annexe. Stone spiral stairs lead to the lower ground floor which has two, comfortably-furnished double bedrooms and one twin bedroom, each with a wardrobe and chest of drawers. The decor in all the ground floor bedrooms is calm and neutral. The walls and wood panelling are all painted in Farrow & Ball colours, and the wooden furniture is also painted in complementary colour schemes. 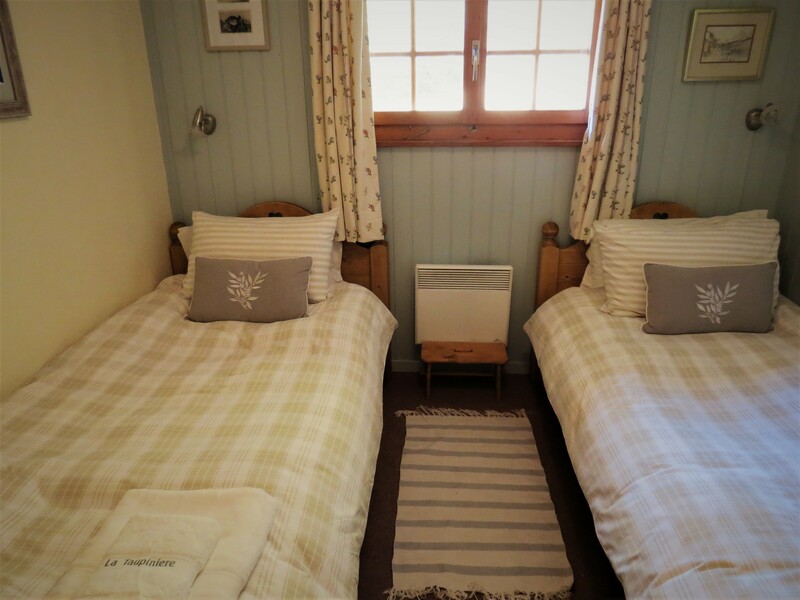 The larger double room (3.56m x 2.75m) has a 5ft (160cm) bed, with a king-size all-seasons feather & down duvet, and feather pillows – and a sumptuous mattress topper. There is a built-in wardrobe, chest of drawers, antique chairs. Bedside tables and lights are on either side of the bed. The decor is cream-painted wood panelling and antique pictures of traditional Swiss dress and scenes adorn the walls. French doors lead onto the terrace and garden. There is also a window to the side, making this room very light and airy. The smaller double bedroom (4m x 2.6m) has a 4’6″ (140cm) bed, lovely sprung mattress luxurious mattress topper. There is a generous king-size all-seasons feather & down duvet and feather pillows. There is a built-in wardrobe, a bedside table, antique pine bookshelf (with plenty of books) and an antique wooden chair. The window looks out onto the garden and terrace. There is a door to the pool room. This room is light and charming. The twin bedroom is 2.76m x 2.76m and has two, single 3ft (90cm) traditional wooden beds with a pretty heart detail in the headboard. For your comfort, there are good mattresses with soft, thick mattress toppers. Snuggle under feather all-season duvets and into feather pillows. There is plenty of storage with a tallboy chest of drawers and a painted single wardrobe. There is room under the beds for cases and bags. The south-facing window is framed with pretty floral curtains and overlooks the garden. 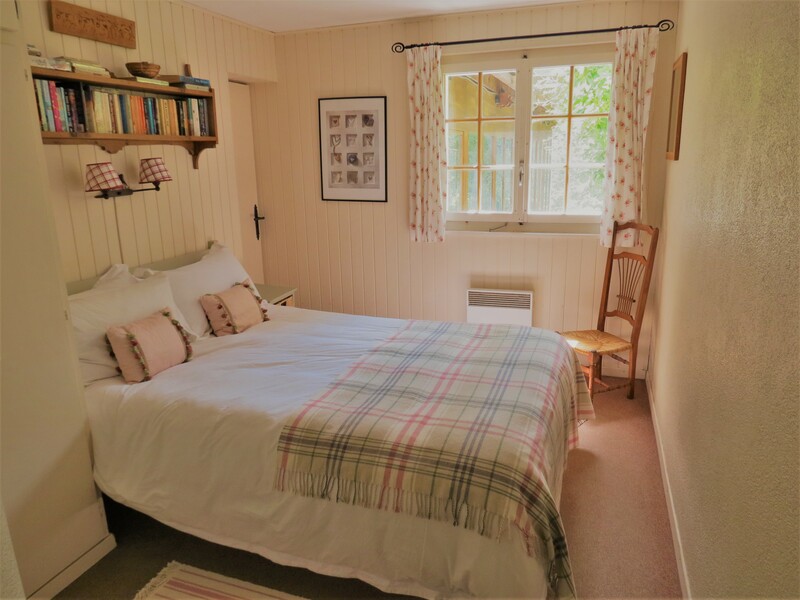 On the entrance/upper level there is a large single bedroom (2.67m x 2.62m) with single (3ft/90cm) bed (with all-season feather duvet, feather pillows and soft, thick mattress topper). The room is furnsihed with a pine wardrobe, pine chest of drawers and a chair. In the corner is a large wash basin. The walls have pine panelling on two sides and a pine panelled ceiling, which makes it lovely and cosy. This room is ideal for anyone unable to (or not wishing to) climb the stairs very often. There is also a separate WC between this bedroom and the front door. The ‘annexe’ bedroom, with its own separate entrance from the driveway, has a wooden double bed (4’6″ / 140cm) with heart detail. There are also two vintage chests of drawers. There is a window to the front and to the garden. There is electric underfloor heating to keep you cosy and warm. The en-suite shower room had a large shower, WC and generous wash-basin, with a window overlooking the pool hall. There is a heated towel rail and underfloor heating. This is a really cosy and romantic room decorated in rustic alpine style with unique, bespoke touches such as the hand-painted door to the shower room. 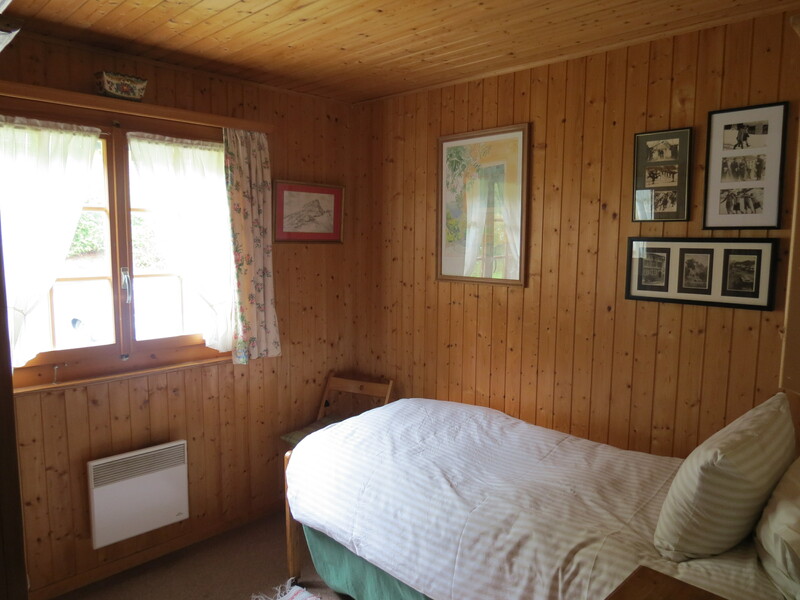 In the main chalet, on the lower ground floor, there is a family bathroom with twin wash basins and cupboards below. The large shower-bath is generous in size and has a large rain-shower head. There is also underfloor heating in the bathroom for those chillier mornings! There is a separate WC next as well, accessed from the hallway. Whilst we do have a large hot water storage tank, the system cannot cope with everyone having a bath in the same evening. However, 9 normal-length showers daily is usually fine. 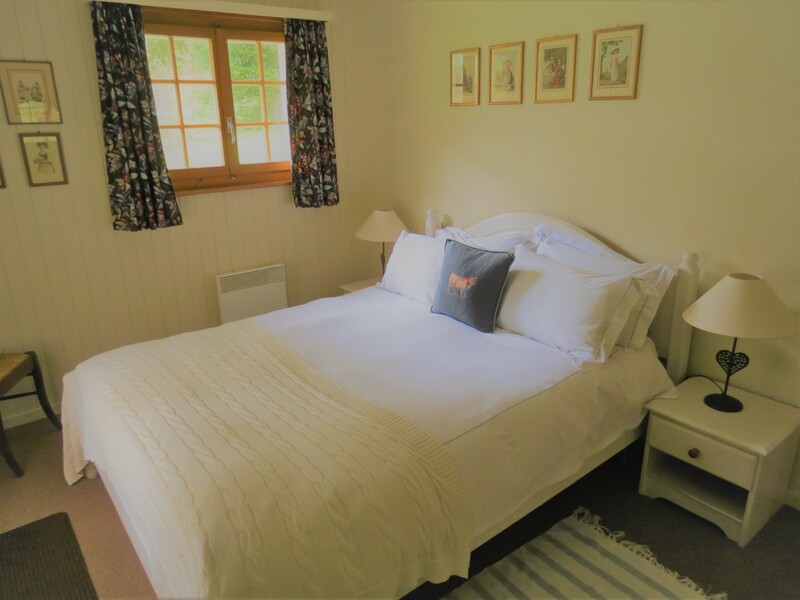 Whilst most of the bedding is feather/down filled, there is also a limited selection of non-feather pillows and single duvets available (usually to be found in the wardrobe of each room). Our bed linen is all made from quality Egyptian cotton. 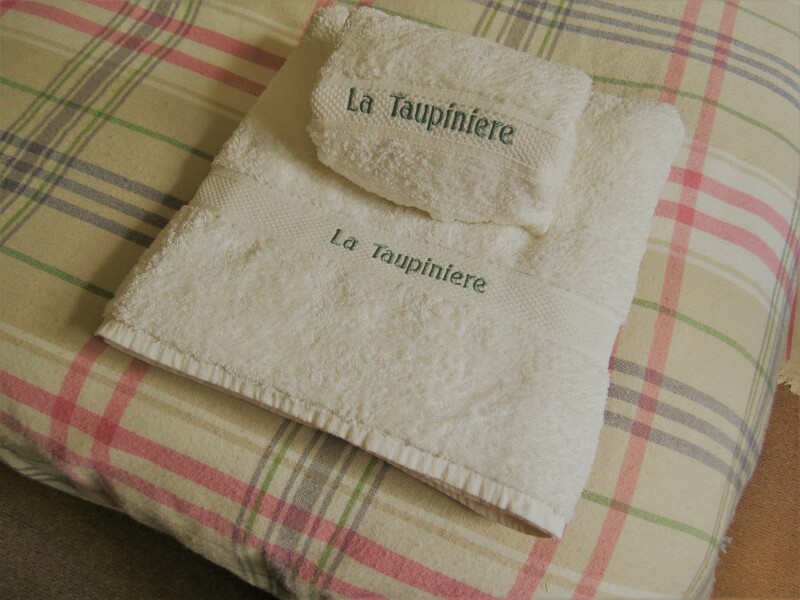 Generous bath towels are provided (one large bath sheet and a smaller bath towel per person), made from bamboo and cotton – super soft, anti-bacterial and environmentally-friendly.